Some particular types of equipment are needed at cattle shows. Often, this livestock show equipment is needed at home as well. A trailer for hauling cattle to a show begins this list. Trailers can cost in the thousands of dollars and the cost can be prohibitive for exhibitors. So, often the local teacher of agricultural education or county extension agent will help exhibitors with hauling their cattle. However, this sometimes is not an option and exhibitors are forced to provide their own transportation. In these cases, some exhibitors will purchase their own trailer to transportation their livestock. Sometimes, it is possible to rent a trailer from local equipment rental agencies. 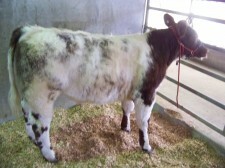 One of the goals of a cattle exhibitor is to groom and train the hair of their calf to grow and be displayed properly. A device is needed to hold the cattle for grooming and washing. This device is called a blocking chute. A blocking chute is generally 6 feet or more tall, about 8 feet long and about 2 and a half feet wide. It has a metal frame and a “cattle head catcher.” Exhibitors will walk their cattle into the blocking chute and lead the cow’s head through the catcher. They will then fasten the catcher to secure the calf in the chute. The blocking chute also has sides to help restrain the calf and protect the exhibitor while working on the calf. Also needed is a variety of hair handling equipment. A good rice root brush and curry comb is a necessity. Also needed is a blower – designed for blow drying cattle. Also, a variety of trimmers and clippers can be valuable as well.